In 1984, Japanese scientists discovered that by hybridizing several mushrooms used in traditional healing they could develop a natural compound that would give the body what it needs to maintain "super immunity." Based on over 20 published studies and the clinical experience of hundreds of hospitals and tens of thousands of consumers, AHCC has become Japan's best selling immune enhancing supplement. Now it's available in America as ImmPower™ AHCC where its gaining the endorsement of leading experts in nutritional medicine. This hybridized mushroom is grown in a liquid medium containing rice bran and enzymatically modified to be readily absorbable. ImmPower AHCC’s superior ingredients are obtained by a highly specialized cultivation and extraction method, and cannot be found in ordinary mushrooms. 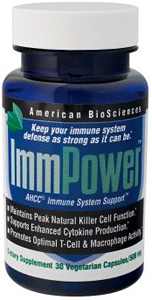 The active ingredient in ImmPower AHCC is an alpha-glucan molecule with a very low weight that research shows provides unsurpassed support of the Defense mechanism of body’s front-line defenses, including maintaining peak Natural Killer cell function, supporting enhanced cytokine production, and promoting optimal T-cell and macrophage activity. AHCC has also been shown to increase levels of interleukin-12 (IL-12), a powerful cytokine that is instrumental in maintaining cell health. AHCC has become Japan’s best selling immune enhancing supplement, and over 700 hospitals and medical clinics in Japan recommend AHCC as part of a regular immune maintenance program. Now it’s available in America as ImmPower AHCC where it’s gaining the endorsement of leading experts in nutritional a substance used in managing discomfort. Compare and switch from the popular immune enhancing supplements with little or no independent research to ImmPower™ AHCC. - Less Expensive than other immune enhancing supplements. Consult a heal care professional first if you are pregnant or nursing.